Darrin Davidson wants to make a difference in Orangeville. The local behavioural therapist confirmed this week that he had succeeded in overturning a ruling that he could not run in October’s municipal election. As such, he now plans to submit his paperwork ahead of tomorrow’s 2 p.m. deadline to make Orangeville’s mayoral contest a three-horse race. A big personality with some big ideas, Mr. Davidson is hoping his third run for political office is a successful one. He ran for a position on council in both 2010 and 2014, missing out on a seat on both occasions. Having taken the past four years to dust himself down, Darrin says it’s the encouragement he’s received from local residents that has made him step up and attempt another run for municipal office. Now, he just hopes the rest of the community buys in. “I have a real vision for what this town can be, and I know a lot of people have a similar vision. There are people who perhaps don’t have a vision looking for someone to make things happen. I’m the guy to do that. This is my third time now running for council. This isn’t about a business card for me. I want people to get to know me, this is who I am and this is what I do. I’m a community guy who cares about the direction we’re going in,” Mr. Davidson told the Citizen in an interview. While most people like to steer away from the word ‘politician’, Darrin hopes to embrace it, saying he wants to show the community what a “real” politician is all about. Preferring not to enter into a mud-slinging competition with his fellow candidates, he opened up when discussing his platform. While he didn’t give specific details regarding how he plans to turn that trend around, he stated boosting economic development in Orangeville is the be-all, end-all of his plan. He wants to create a system that will encourage more businesses to set up shop in Orangeville. One thing he hopes to accomplish as mayor is doing what he can at Council to help make Orangeville Canada’s lacrosse capital. With hugely successful programs from the junior level all the way down to tykes, Mr. Davidson believes the community has everything in place to be recognized as the national leader when it comes to Canada’s national sport. He has embraced the idea of developing a central park in Orangeville. While he didn’t disclose details regarding placement of the potential park, Darrin feels it’s vitally important to create a space in town that can be enjoyed by people of all ages. He wants to transform the community’s biking and trail systems, while he also plans to meet with Credit Valley Conservation to see what plans the organization has to develop its Island Lake Conservation Area. A lot of these ideas, should they be implemented, would come at a considerable cost to the taxpayer. Mr. Davidson has identified one key area where, he believes, the municipality can save a significant sum of money each and every year. Darrin says he will act as a shield for this community if they decide he is the right man to lead the town forward. 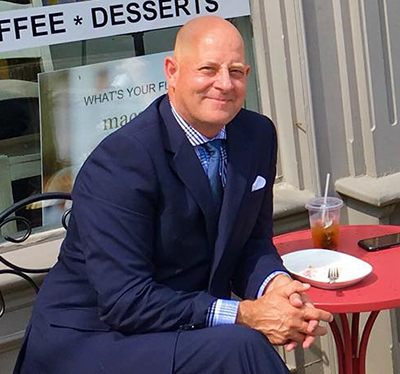 He believes he has the skills, ideas and experience to make a difference in Orangeville. “I will be everything this community is looking for. I’m authentic, I’m passionate, I’m genuine. I stand in front of the issues. I’ll take on all the burden – the taxes, the debt, the homelessness, the drugs. If you want to be mayor, there’s no excuses and I won’t make a single one,” Mr. Davidson said. “You can fake your way through this and get some things done, or you can actually give it your all. Why should people vote for Darrin? Because I’ll get the job done, no matter what it is.